Маджонг – game rules. Интерфейс – see how to play Маджонг on GameDesire! At the top of the screen, there are two icons: "Gamechip" which gives you access to the payment section and "Lifeboat", which redirects you to the help section. Below you can find the game variant selection menu. You can either play alone or play with others. The middle part of the window is occupied by an information panel with the details of your XP level, Gamechips, achievement collection, friend list and recent winners. Below you can also find the ‘Add Gamechips’ option and open Room List. Additionally, in the lower portion of the screen you can see information about the number of players online and your current account balance. In the top left corner you can find a lifebuoy symbol, which takes you to the help section. The Gamechip symbol allows you to quickly purchase additional Gamechips. In the top-right corner additional settings are displayed. There you can find buttons for taking screenshots, customizing tiles, modifying chat and audio preferences and returning to lobby. Below the table there are three modules. The left one contains information about your score, XP level as well as available shuffles and hints. By clicking buttons in the middle module you can use available hints and shuffles or finish the game. 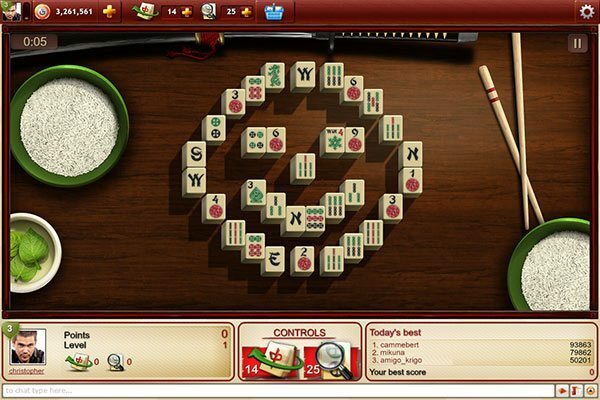 The right module provides information about top scores, both yours and other players. 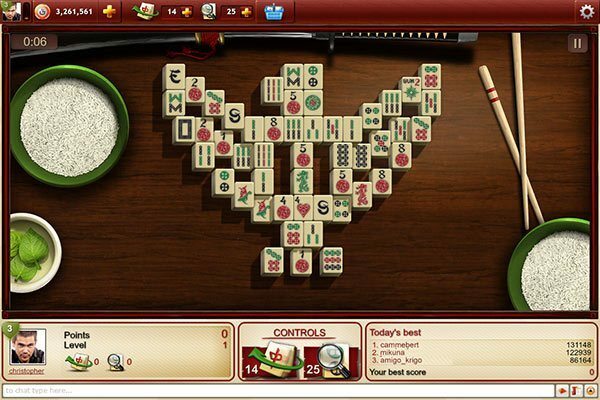 The bottom part of the screen consists of chat, player information, friends list and top scores (depending on the table settings). In ‘play alone’ mode you have 10 hints and 5 shuffles at your disposal. If it is not sufficient, you can always buy additional coupons. Each extra coupon gives 4 hints or 2 shuffles and costs 1000 Gamechips. Buying extra coupons prevents your score from being submitted to the top score table. Each 5000 points collected in a single game grants you +1XP. 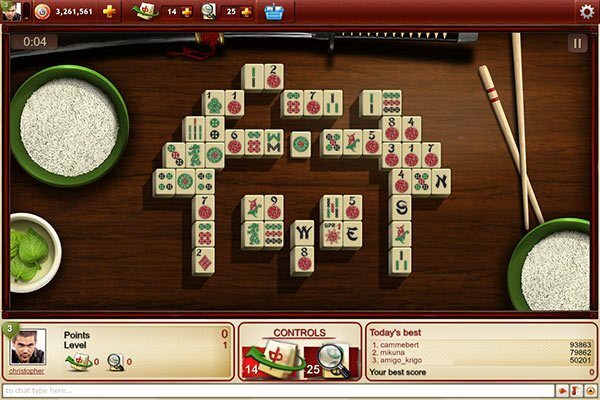 In this mode you compete against other players. The winners is the person who scores the most points within the allotted time. 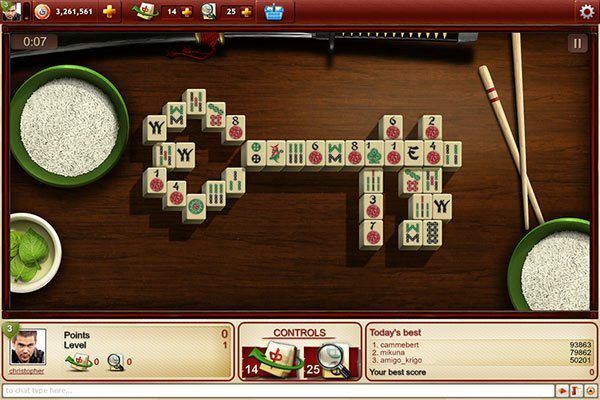 The player setting up the table chooses the type of the game. Available modes include: Monkey, Tiger, Snake and Dragon, all of which vary in time limit and number of available coupons per player. The layout of the game window is very similar to the one in ‘play alone’ mode. The only difference is that the panel below the table has a slightly different functionality. The left module now informs you about your ranking, while the right one contains statistics of the leading player. The first coupon is always free, while each additional coupon costs 1000 Gamechips in this variant. The amount of XP depends on the outcome of the game as well as on the number of competitors.